We look forward to welcoming you to the newly updated, 100% smoke-free Sheraton Suites Orlando Airport. Take advantage of our complimentary 24-hour shuttle service to and from Orlando International Airport (MCO), just one mile away. Our all-suite hotel will greet you with comfort and warmth as you settle in and start to explore nearby Orlando, including Walt Disney World, Port Canaveral, SeaWorld, and Universal Studios. 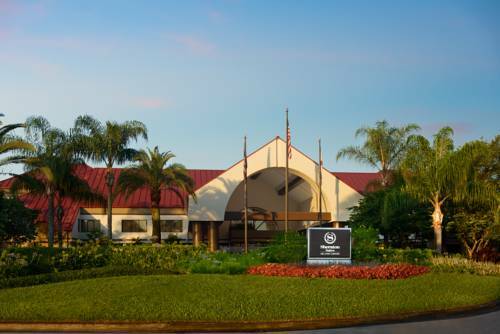 We are also close to Lake Nona, Nemours Childrens Hospital, and the Orlando VA Medical Center.Each spacious suite boasts a warm, cozy atmosphere, contemporary styles, and comforting Sheraton touches. Keep in touch with complimentary High Speed Internet Access at an ample workspace while staying energized with fresh-brewed Starbucks coffee or Tazo tea. The separate living area is complete with a mini-refrigerator and a microwave. Spend a quiet evening in front of the 40-inch LCD flat screen TV with in-room movies, or relax beneath the crisp sheets and soft blankets of your Sheraton Signature Sleep Experience bed.Feel free to use one of our computer workstations, located in our welcoming lobby, or bring your laptop for complimentary wireless High Speed Internet Access. Take a swim in our indoor or outdoor heated pool, and work out in our state-of-the-art Sheraton Fitness. Connect with family, friends, or colleagues over delicious dishes at the Sky Grille, grab a Starbucks coffee and a snack to go at Sky Express, or unwind with a cocktail in our inviting lounge.Let us help you plan your next business meeting or social event in one of our charming, versatile venues. With professional staff on hand to assist with coordinating and catering, our state-of-the-art function space is ideal for hosting your gathering.Enjoy friendly, personalized service and the comforts of home at Sheraton Suites Orlando Airport. Get your day going at Sky Express with a fresh Starbucks coffee drink, a Tazo tea, or a grab-and-go treat, such as one of our delicious scones and bagels. Starbucks, sandwiches, salads, snacks, pastries, ice cream, beer/wine and more are available! Get your day going at the Link@Sheraton Caf with a drink using Starbucks beans, including coffees, espressos, lattes, Frappuccinos, and iced drinks. Or choose from our full selection of fresh scones, bagels, and other delicious treats. Join us for classic American cuisine at breakfast, lunch, and dinner at our new Sky Grille and Sky Bar. Watch a game while enjoying a cold beer or a delicious cocktail.